Successful NIDCAP Nursery Certification represents distinction in the provision of a consistently high level of NIDCAP care for infants and their families, as well as for the staff, and as such is to be commended and celebrated as an inspiration for all. The NIDCAP Nursery Program under the auspices of the NIDCAP Federation International (NFI) supports and recognizes a hospital’s commitment to uphold and integrate the principles of the Newborn Individualized Developmental Care and Assessment Program (NIDCAP) for all infants, families, and the staff, into its nurseries. A NIDCAP Nursery provides a dynamic environment for the full integration of expert medical and nursing care securely embedded within the active pursuit of mutual respect, caring, nurturance of and collaboration with infants and families, and among all professionals and staff members. A NIDCAP Nursery engages in a continued process of self-evaluation and growth towards exemplary care as evidenced in NIDCAP Nursery Certification. The NFI’s NIDCAP Nursery Program resources and materials are available free of cost for nurseries to utilize for their self-evaluation. The process of nursery self-assessment and reflection offers the opportunity to identify areas of current strengths as well as areas for future growth. See the Self-Assessment Overview page for further information on nursery self-assessment. 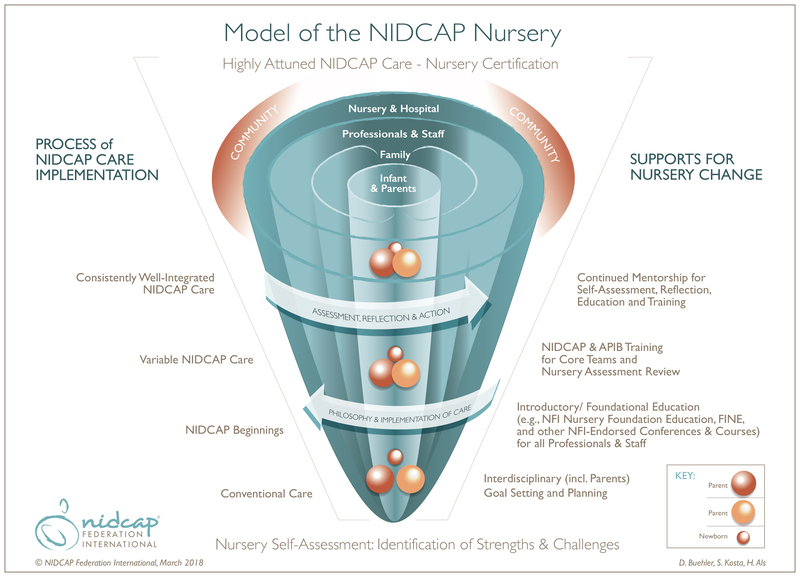 The NIDCAP Nursery Program offers certification for hospitals and their nursery systems. The distinction of Certification as NIDCAP Nursery is awarded for nurseries that demonstrate consistent promotion of the best short and long term development of all infants and families in their care and of the support for their professionals and staff in accordance with the principle of best personal and professional development towards relationship-based care implementation. See the Certification Overview page for further information on nursery self-assessment.